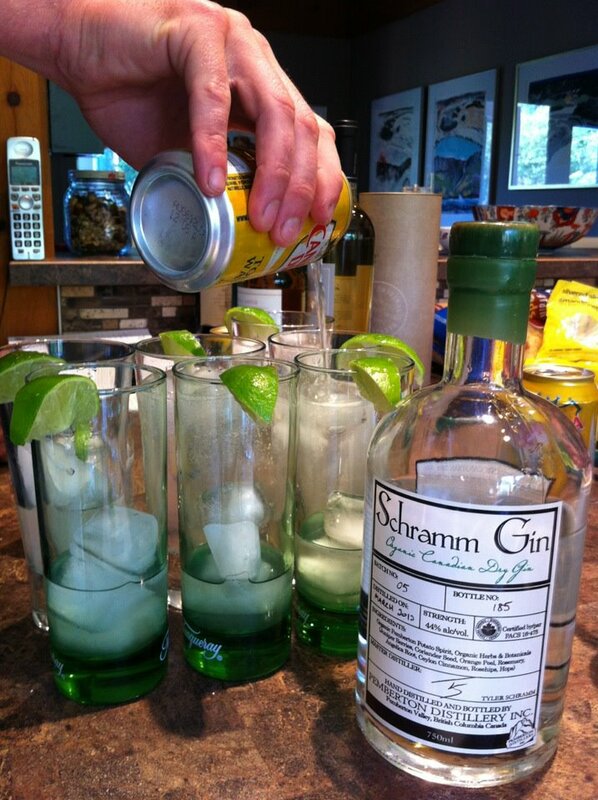 If James Bond came to Pemberton to celebrate Thanksgiving (giving that it is the best place in Canada to spend the harvest celebration, according to the Huffington Post), the first place he would go would be Schramm’s Pemberton Distillery. Because they make a mean martini. A visit to the newly opened distillery was our 4th post here on Choose Pemberton, (114 posts and 25,550 views ago), way back in 2010. So with 2 years under their belt, a host of awards, and a new apple brandy brewing, we figured we were well overdue another check-in. 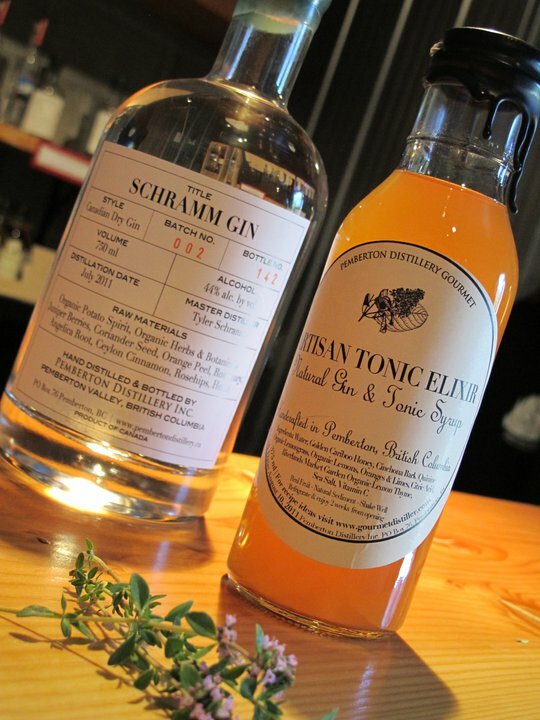 When Schramm Distillery started out making their signature potato vodka, a spirit that successfully crash-tackled the status quo (“no one makes vodka with potatoes”), won awards and helped put Pemberton on the map as an agritourism destination, they weren’t content to rest on their spud-lovin’ laurels. Nor did being named one of the top 40 foodies under 40 by Western Living magazine give them pause. Not happy just being amazing at vodka, they’ve debuted a highly acclaimed gin and continue to open minds and tease palates. We checked in with Tyler and Lorien Schramm to find out more. We estimate about 2000 visitors came through the distillery this summer. We have a Guest Book but we aren’t keeping score. How has your product line expanded since you opened in 2009? 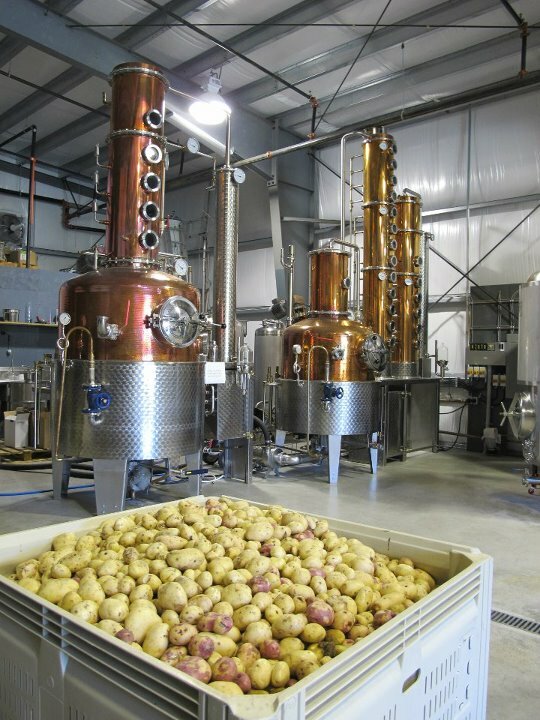 We originally planned to produce organic potato vodka and single malt whisky. We now produce an organic potato based Gin, Barrel-Aged Apple Brandy, Fruit Liqueurs and this fall an organic absinthe (also based on potato spirit). What has been the most successful experiment? Our Gin. We took a gamble using potatoes to create the base spirit for our Gin (almost all Gins start from a base of grain neutral spirit) and we’re really happy with the way it turned out. Based on customer feedback, they are happy with the Gin too! What was the biggest disaster? Running out of potato spirit this fall! We don’t get potatoes over the summer months (organic potatoes don’t store well in warm weather) and so we have to plan for our winter production of potato spirit to last us from May – September. 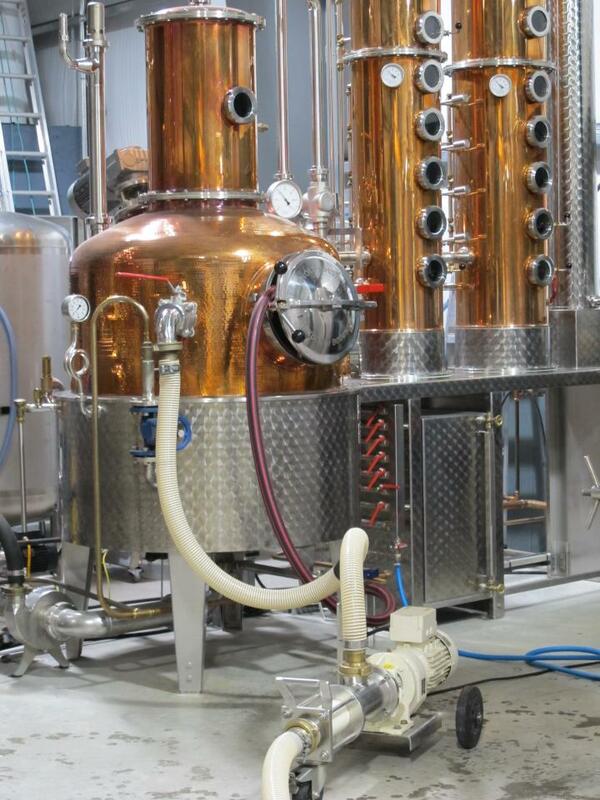 This summer with the Gin and Vodka both using potato spirit we ran out and are now working very hard to catch up! 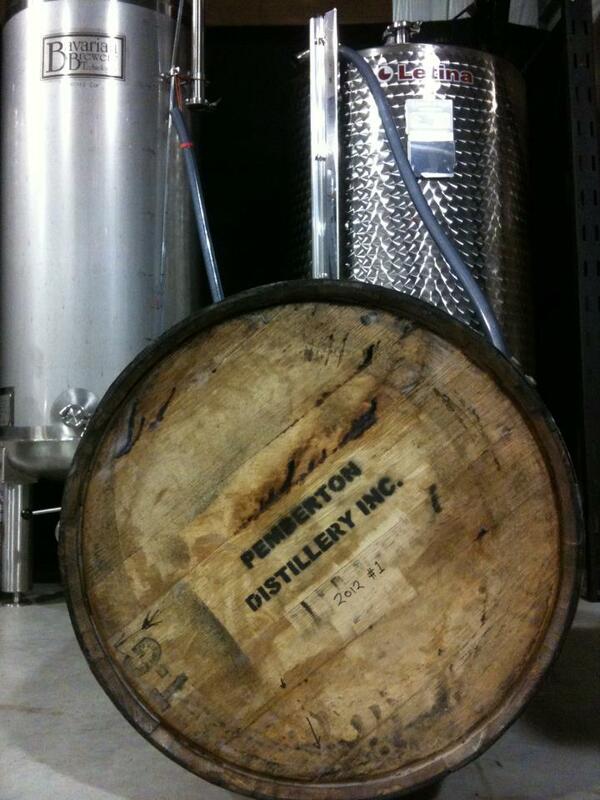 What kind of volume is coming out of the distillery this year? This year we are on track to produce about 5,000 Litres of spirt in total (shared between Vodka, Gin and Whisky). A large distillery could produce our annual output in half an hour! And is everything still being hand bottled and labelled? Yes, we’re fortunate to have a big family who are willing to volunteer for bottling. What’s the size of your potato order? Is it still 1633 kg every week? We installed 2 new fermentation vessels this summer allowing us to produce 5 batches of potato mash per week, approx 2000kg of potatoes per week. What’s more important to you? That local people bring visiting friends and family by, that your spirits get accolades from the likes of Beppo Crosariol and Jurgen Gothe, or that they win awards at major shows? We love having locals visit and bring their friends and family. It’s also really nice when Pemberton gets recognized for producing unique products on a provincial and national level. You have enjoyed some great media coverage. What have been some of the highlights? Was there anything that had you dancing around the living room? Our potato vodka winning the Double Gold medal at the World Spirits Awards has been the biggest highlight to date, especially as it gave us recognition among our distilling peers. There was definitely some dancing when we got news of the award! 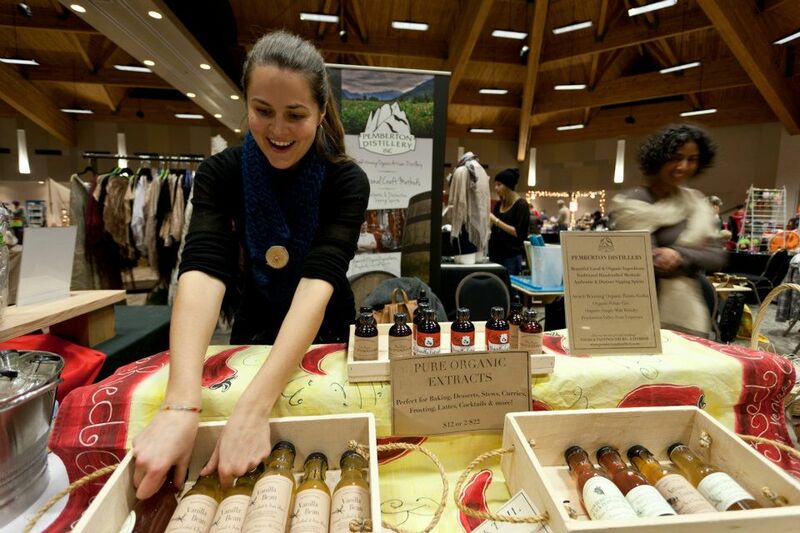 You guys also support a lot of local events, and do a huge number of tastings and craft shows. How many shots have you poured? How many martinis have you shaken? We are a small family business and don’t have much, if any, of a marketing budget. We spread the word by participating in tastings, sharing our products and our story, meeting our customers and hearing their feedback. It’s important to us to support our local community as much as we can. As for the number of shots and martinis, probably in the thousands! What do you attribute your success to? Anything in particular? 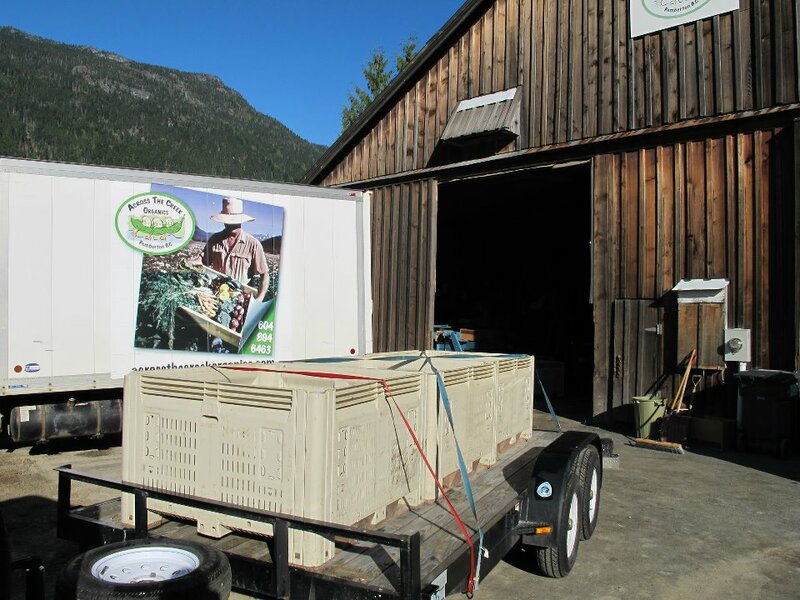 We have to give huge props to Bruce and Brenda Miller at Across the Creek Organics Farm because right from the start they agreed to work with us and have been extremely supportive throughout. They supply us with the highest quality potatoes which are the key to our business. From the beginning we decided that if we made a high quality, authentic and unique product, that the rest of the pieces would fall into place. We’ve taken that same strategy with every spirit that we’ve produced and so far it is working for us…And we also committed ourselves to putting in extremely long hours. 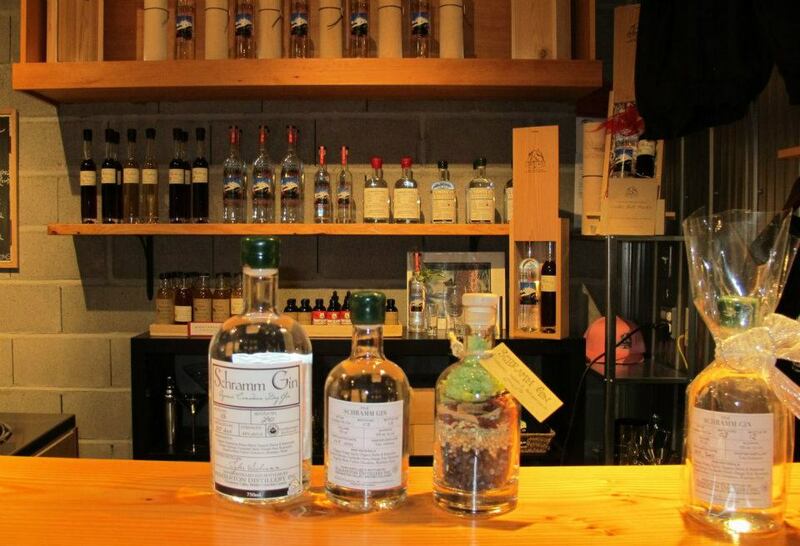 What do you think about the rise in craft distilling? Do you think there’s a resurgence or even a revolution of sorts going on? Was your timing just lucky? Do you feel as though you’ve been able to ride a rising tide of interest in organic and craft beverages? Yes to all of the above. We are optimistic about the rise of the craft distilling industry in North America and grateful that people are increasingly seeking out regionally made and unique spirits to enjoy. We would like to see that the integrity of the craft distilling industry is upheld and that craft distilleries use local agriculture to produce their spirits. Unfortunately there are now craft distilleries choosing to buy cheap imported ethanol and redistilling it as a local craft product. This adds little value to the local economy and risks the reputation of our industry. In your experience, how much more are people willing to pay for craft distilled liquor? Not much, our craft spirits are in line with mass produced premium spirits. We do notice that people are willing to pay more for a spirit that is high quality and unique. So, this is an idea that has been distilling since 2003. Did you know it was going to take so long to take an idea and manifest it? Has that made you more cautious or more courageous when it comes to big ideas, new things, or being entrepreneurial in general? We knew it would take awhile. When we started distilling we were a bit cautious but as our spirits have become more known it has given us confidence to experiment more. We have many ideas that we would like to pursue, and just need the time to take them on. Why Pemberton? What makes Pemberton a great place for you guys to live and base yourselves? Pemberton has an abundance of high quality agricultural raw materials, especially potatoes and pure mountain water, that are essential for a craft distillery. We don’t have to ship our raw materials in from far away, we can drive 15km down the road and pick them up ourselves. This also means we enjoy close personal relationships with our suppliers. Outside the business, we are both very outdoors oriented people, similar to most of the people who choose to live here, and we love this community and living here. Now that you have distilled so many local products, from potatoes, to junipers, to berries…. what would you say is the “flavour” or “essence” of Pemberton? The Pemberton potato will always be the key flavour of our business. It would have been easy to distill a totally neutral, tasteless, aroma-less potato vodka but we felt that would not showcase the unique character of this region. How big a deal has the recent change in BC liquor rules been for you? Could they still be more sensible/less archaic? The rules haven’t changed. Changes have been proposed but we have been in this position before. However, if the proposed changes do happen it will make a huge difference to us. Talk to us about the local food eco-system? I’m interested in the way you source your potatoes from Across the Creek Organics, then give your mash to North Arm Farm’s pigs. 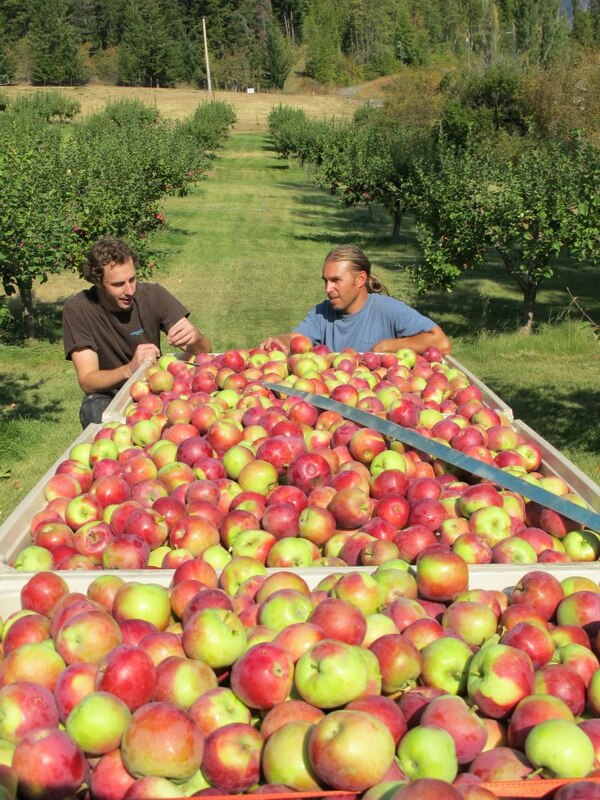 Can you map out the inter-relationships that exist between you and local suppliers/growers? Do you think this is good for the local economy? Do you think that value added food businesses are still an opportunity for local entrepreneurs? We buy potatoes from Across the Creek Organics; Blueberries, Cherries and Apples from the Hare Family Farm; Apples & Pears from Riley Creek Farm (Lillooet) and several Birken and Pemberton Valley farms; wild gathered berries from Lil’wat First Nations, Organic Hops from Jon & Jenine Schramm’s Hop farm; fruits, vegetables and herbs from North Arm Farm; Malted Barley from Gambrinus Malting in Armstrong; Honey from Golden Cariboo Apiaries (Lillooet). We’re trying to make our business as closed circle as possible. We give our waste mash to North Arm Farm (animal feed), Root Down Organics (animal feed) and Jon & Jenine’s farm (compost). As our business grows we will continue to choose local suppliers and businesses.We definitely feel that businesses focused on adding value to Pemberton agricultural products have a lot of possibility. People are seeking out unique food products and the Valley offers so much potential to fill that need. Okay, final question. Are parties are your house, like, THE BEST? How do I get an invitation?!?! If we had time to have parties at our house they would be awesome! Next year we plan to celebrate the 3rd birthday of our first cask of whisky (similar to Scotland, in Canada whisky is not officially whisky until it is aged 3 years in wood).